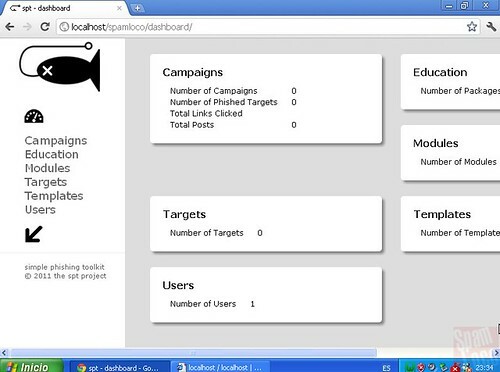 The sptoolkit (rebirth) or Simple Phishing Toolkit project is an open source phishing education toolkit that aims to help in securing the mind as opposed to securing computers. Organizations spend billions of dollars annually in an effort to safeguard information systems, but spend little to nothing on the under trained and susceptible minds that operate these systems, thus rendering most technical protections instantly ineffective. A simple, targeted link is all it takes to bypass the most advanced security protections. The link is clicked, the deed is done. spt was developed from the ground up to provide a simple and easy to use framework to identify your weakest links so that you can patch the human vulnerability. sptoolkit hasn’t been actively developed for two years. As it stands, it’s a brilliant peice of software, and the original developers are pretty damn awesome for creating it. But a new team would like to go further, and bring sptoolkit up to date – they’ve started active development again on Github just last month.